Hit counters are found on very site on the internet – though they barely go by that name anymore. Modern hit counters are invisible, fast and do more than keep track of the number of times a web page was loaded. Suites like Google Analytics record which geographical region a visitor is from, what operating system they use, and how much time they spend on the website. The hit counter I built may not do any of those things, but it does keep track of hits, and in the most complicated way possible. One of the happiest moments backs as a Teaching Assistant in college was when a Professor told me to build a underwater autonomous course under $1000 and out of Lego Bricks. There are a lot of things to over come if you are building one. But its not impossible to build a pretty intelligent Lego submersible. Especially when they are now digital with microcontrollers and sensors. One of my favorite examples was when Rhode Island University Beat MIT’s AUV with their Lego version. Well… there is a catch. The images are too light and it must be used and loaded in dark environments. I hope to make a better one some day. Here is a little Candy dispenser I made for the office one day. I bought one of those massive bags of M&M peanuts and the guys around the office finished them in a day. 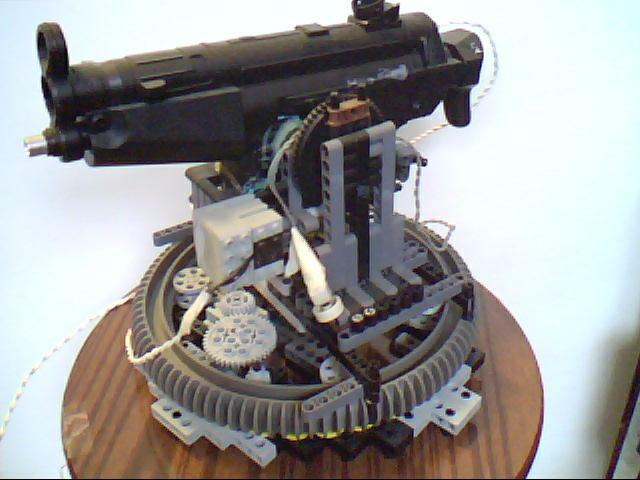 This was a little Lego Turret I built using 80% ABS Lego Bricks. The other 15% is an automated BB gun. I control it using the standard Lego Motor box and the BB Gun is powered using a Cell Phone Charger as a power supply 5V at 1A. The base is wide so the recoil of the gun doesn’t tip the gun over. Plus it gave me the chance to use the oversized wheel from my dissassembled Lego Starwars Hail Fire Droid and use it for lazy Susan. Some of you can add better than I and realize I’m missing 5%. That 5% is a resin I used to attach some Lego Beams to the Gun. By doing that I Lego-ized the gun in case I ever need to rebuild it. The toy is a manual control turret so it doesn’t need limit switches.